In the MCS project we are working we have to create some SOAP Connectors to integrate with Siebel. A great thing of MCS is that although we are going to consume a SOAP web service, the XML payload is automatically translated into JSON. You can get more info in MCS Documentation. I would like to thank Oracle Mobile PM team, specially Grant Ronald and Frédéric Desbiens for their great help and for sharing best practices about this issue. As soon as we create a SOAP Connector and try to test it we can see that the body we have to provide is a JSON. The translator seems not to add the namespaces in the header therefore Siebel cannot parse the request. The solution is to send a XML instead of a JSON, bypassing the translator. We can test this in SOAP Connector tester. As we need the required XML, we can get it in any web service client tool like for example SoapUI. We also have to set "Content-Type: application/xml;charset:UTF-8" and "Accept: application/xml" as header parameters. If we test the Connector we can see that the web service call is working. How do we implement the Custom API to send a XML payload to the connector? The answer is to set the XML we want to send as the body of the request and set the header parameters we previously use to test the connector. In this example test_rrs is the directory where the package.json file resides. First we need to add var xml2js = require('xml2js'); at the top of our implementation. This is the tricky part, we need to create a JSON like this.
' $ ' means that we want to add attributes to the XML element.
' _ ' means that we want to have something inside that element. The last thing we have to do is to create a xml2js.Builder object and execute buildObject method using the json object we have just create. The result of this method is the body we are going to send. After the implementation is done we just have to put everything inside the zip file and upload it to MCS. If you want to know more about xml2js click here. One of our customers required to filter data in a page with a tree component. 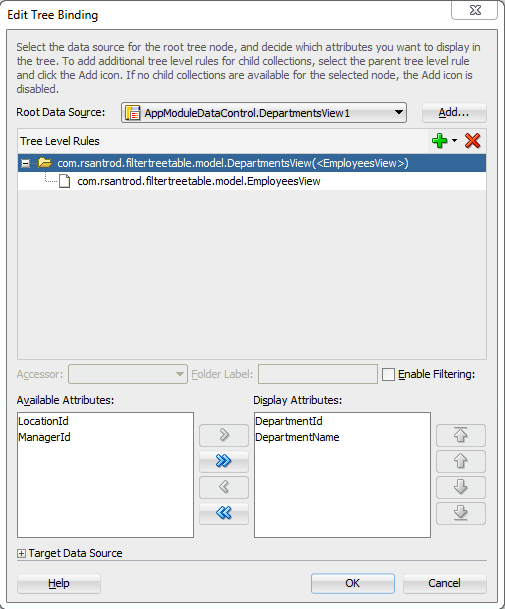 Using Ashish's post I am going to show you how to filter both parent and child nodes having just a single filter value. This can also be applied to treeTable component. The first thing we need is a tree component and data structure, in this case we are going to use Oracle's hr schema tables: Departments and Employees. In our page we drag and drop DepartmentsView from datacontrols palette and create a tree component. The next thing we have to do is to create a View Criteria in Departments View Object (parent). 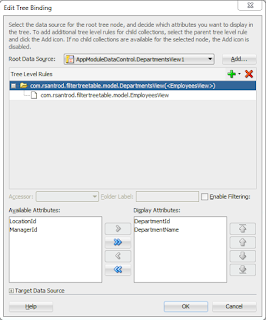 We also have to crete a View Criteria in Employees View Object (child). We have to expose setter method of the bind variable in parent View Object. The last step in the Model is to set a default View Criteria in parent View Object. To set it we have to right click on the View Object instance in our AppModule, click on 'Edit', select the View Criteria and click on 'Ok' button. The Model is now finished, we now have to drag and drop the setter method from the data controls palette and create an 'ADF Parameter Form' so we can provide the filter value. This will create 'setsearchValue' method binding in the pageDef. We also need to create a Execute operation of the parent View Object and call both operations from the 'Filter' button ActionListener. This is how we should have the page. If we run the application we can see the if we filter by 'pat' we just get values that contains that string. If now we filter by 'les', we can see that we get values with 'les' string in both parent and child nodes.